Cobras are known for their agility and keen sensitivities. AudioQuest King Cobra incorporates all of the advancements bestowed upon Diamondback with one exception: The addition of Perfect-Surface Copper conductors (PSC+). PSC+ causes less harm to the signal offering another level of dimension and clarity for an experience you won’t soon forget. SOLID PERFECT-SURFACE COPPER+ CONDUCTORS (PSC+): Perfect-Surface Copper+ has an astonishingly smooth and pure surface. Proprietary metal-processing technology protects the wire’s surface at every stage of drawing and fabrication. When high-purity low-oxide copper is kept as soft, pure and smooth as possible, it becomes a wonderfully low-distortion PSC+ conductor. PSC+ is manufactured by applying the same exceptional technology to an ultra-pure copper. The resulting sound quality is even more focused and simply less in the way. For over 30 years AudioQuest has pioneered the use of superior metals; yet even we were surprised by the huge leap in performance made possible with Perfect-Surface Technology. PSC+ simply outperforms all previously available copper metals at any price. All of King Cobra’s conductors are solid. Electrical and magnetic interaction between strands in a conventional cable is the greatest source of distortion, often causing a somewhat dirty, harsh sound. Solid conductors are fundamental toward achieving King Cobra’s very clean sound. POLYETHYLENE AIR-TUBE INSULATION: Any solid material adjacent to a conductor is actually part of an imperfect circuit. Wire insulation and circuit board materials all absorb energy (loss). Some of this energy is stored and then released as distortion. 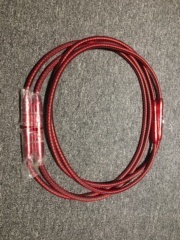 All of King Cobra’s conductors use PE Air-Tube Insulation because air absorbs next to no energy, and Polyethylene is low-loss and has a benign distortion profile. PE Air-Tube Insulation causes much less of the out-of-focus effect common to other materials. CARBON-BASED 2-LAYER NOISE-DISSIPATION SYSTEM (NDS): 100% shield coverage is easy. Preventing captured RF Interference from modulating the equipment’s ground reference requires AQ’s Noise-Dissipation System. Metal and Carbon-Loaded synthetics prevent most RFI from reaching the equipment’s ground plane. 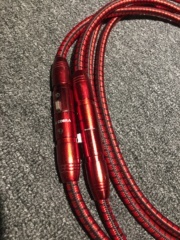 TRIPLE-BALANCED GEOMETRY: The three conductors in “Triple-Balanced” King Cobra cables ensure that whether prepared with RCA or XLR plugs, the positive and negative signals have equally low-distortion conducting paths. The 100% coverage shield is never used as an inferior conductor.